There's a fantastic column in today's New York Times Food Section. In it, wine writer Eric Asimov says what so many lovers of complex white wine already know: That drinking it too cold is the best way to diminish the amount of pleasure it ultimately delivers. The opposite side of this coin is serving red wine too warm, which, when temperatures climb high enough, can result in fruit that tastes flat or even cooked. And with high-octane bottlings, it can make the alcohol jump right to the fore and overwhelm everything else. (Ever tried a room-temperature Barossa Shiraz?) Which is why, at home, I taste all of my wines--as long as the situation allows it--right from the cellar at 55 degrees. As often as not, the reds only need a couple of minutes in the glass to come up to the optimal temperature, and the whites, surprisingly enough, are typically ready to go, especially if I'm drinking the white Rhones and Burgundies I love so much. 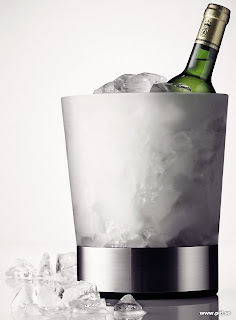 The point is this: Don't be afraid to experiment with the temperatures at which you serve and enjoy your wine. The only thing you have to gain, after all, is more drinking pleasure. Which is what it's all about anyway.